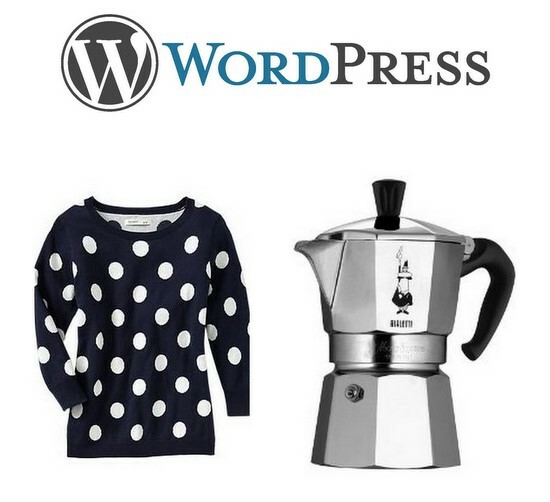 Above: WordPress.org; Old Navy polka dot sweater; Bialetti 3-cup moka pot . First, I broke down & bought the Old Navy polka dot sweater that’s been featured all over blogs & Pinterest. I haven’t received it yet, but I’ll post a mini-review when it arrives. So cute. UPDATE: I returned the sweater. It’s cute in person, and good quality for Old Navy, but the print makes you look significantly wider/bigger up top. I’m short & curvy, so this just wasn’t the look for me. Two bloggers who make it look good, though: Mix & Match Fashion & Petite Little Girl. Second, I recently discovered moka pot coffee, aka “espresso for poor people.” Of course, it’s not real espresso, but it’s still intense and good. I’m using a Bialetti 3-cup moka pot & Lavazza espresso ground coffee. Finally, I’m currently setting up self-hosted WordPress sites for several clients. In doing so, I’ve realized that I’m ready to transfer my blogs to WordPress. Typepad has been great all these years, but I need something more customizable & functional. I want jQuery slideshows and responsive site design like everybody else! What are you guys currently enjoying? Orange spice tea from Arbor Teas (fair trade, organic and all that), rose and black pepper cookies from Whimsy and Spice on Etsy (pricy but delicious), and this blog, at the moment. In terms of clothes, I am so loving the 40s vibe that is in the stores, like this dress, which I bit my lip and paid full price for and so apparently did everybody else. ASOS has a number of 40s-ish dresses as well. That’s a lovely dress! It’s hard timing sales with Anthropologie; the items I like never go on sale or never have my size when they do. The Whimsy & Spice cookies look delicious, too.